So you want to build a new deck for backyard entertainment and leisure. This is a great idea, especially when you consider that decks yield a solid return on investment in terms of home improvement projects. But don’t make the mistake of assuming every deck contractor is the same. This holds true when searching for any contractor. Search deck installers in your area and come up with a broad list of candidates. Before contacting a professional, consider the deck’s layout, any staircases and coverings, materials, railings, etc. Once you understand the scope of the project, start taking a closer look at your list of contractors. Note important factors such as experience, areas of expertise, and locations. If you can’t really get a feel for a contractor by their website, it’s best to move on to the next candidate. Now’s the time to whittle down your list of contractors. Ask about their experience, licensing, and insurance, among other things. They should also give a general idea as to when they can start the project and how long it will take to complete. 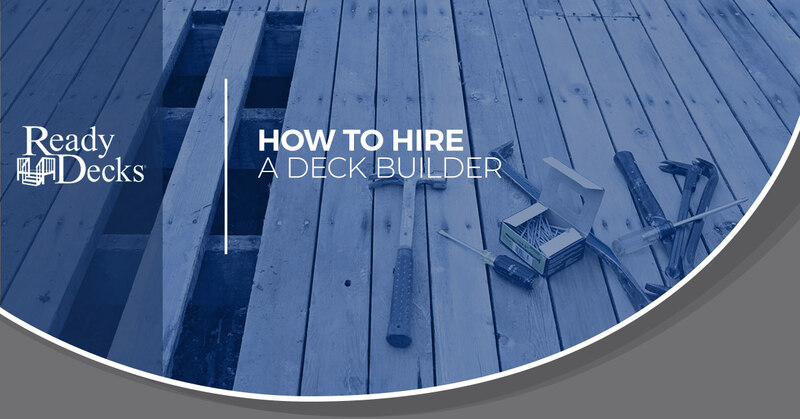 When interviewing your deck contractors, remember to ask for several references. If they’re at all reluctant about doing this, a red flag should go up in your head. You’re just about ready to make a decision but need some additional clarity first. If any friends, coworkers, or neighbors recently had a deck built, ask them about the contractor they used. You might find that the person they hired is, in fact, on your list of finalists. At this point, invite two or three contractors out to your site and have them provide a written estimate of costs. The estimate should include details such as cost breakdowns, material information, and hourly labor costs. Maybe you’re thinking, “I’m just going to go with the lowest price and call it good.” That’s not the best strategy with any home improvement project, but especially decks. You want your deck to be installed properly the first time so you don’t need to worry about costly repairs in the near future. By now, hopefully, one contractor stands out in your mind. It doesn’t hurt, though, to reach out to references and ask about the quality of work, professionalism of the crew, efficiency in completing the project, etc. Lastly, we recommend obtaining a certificate of insurance directly from the carrier. Here at Ready Decks, we understand you have options when it comes to finding the right contractor for your project. Rest assured that our team does things differently. For nearly two decades, Ready Decks has been combining the highest quality materials with an innovative, patent-pending building system. The results speak for themselves as we continue to expand our business throughout the south. Let us take the hassle out of finding a deck contractor.